This is an important message from the Mangere Lawn Cemetery Trust Board!! Please Read Carefully!! At the time of its inception, the Columbarium Wall was highly regarded as a very modern option for the interment of cremated remains. In more recent times it has become apparent that, for a number of reasons, the Columbarium is no longer falling within the design parameters that it was created to achieve. 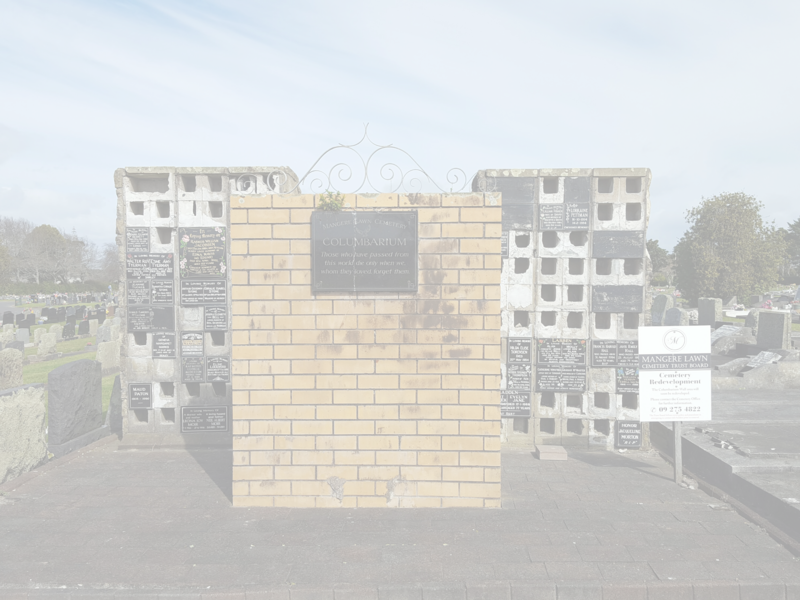 The general deterioration, despite our attempts at ongoing maintenance, and the aging of the structures, the lack of visitor parking and seating, in addition to our own operational issues, The Mangere Lawn Cemetery Trust Board has initiated a program to address the concerns we face. The program involves the transfer of the existing ash interments and associated plaques to the Mountain View Ash Gardens and it is to this end we have contacted you. All costs in relation to the transferring of the ashes and plaque, and also the provision of a flower vase are being met by the Trust Board. If you would like any further help please feel free to email us at info@cemetery.co.nz or phone 09 275 4822 to make an appointment to come in and see us. Website by Mace IT Services Ltd.